ASTA and its members are dedicated to providing clean, safe spice to their customers and consumers. ASTA provides a range of programs and publications to ensure companies have the tools they need to meet that goal. Clean, Safe Spices was published in March 2011 as guidance for the spice industry on food safety. Companies are encouraged to implement the recommendations contained in the guidance and distribute the guidance to their suppliers and customers. Additional publications and programs have been developed to support implementation of the key recommendations. All publications are available free to members and many are also available free to non-members. There is a fee for access to educational recordings. Not a member yet? Visit Membership to find out more about the benefits of membership and how to Join ASTA. 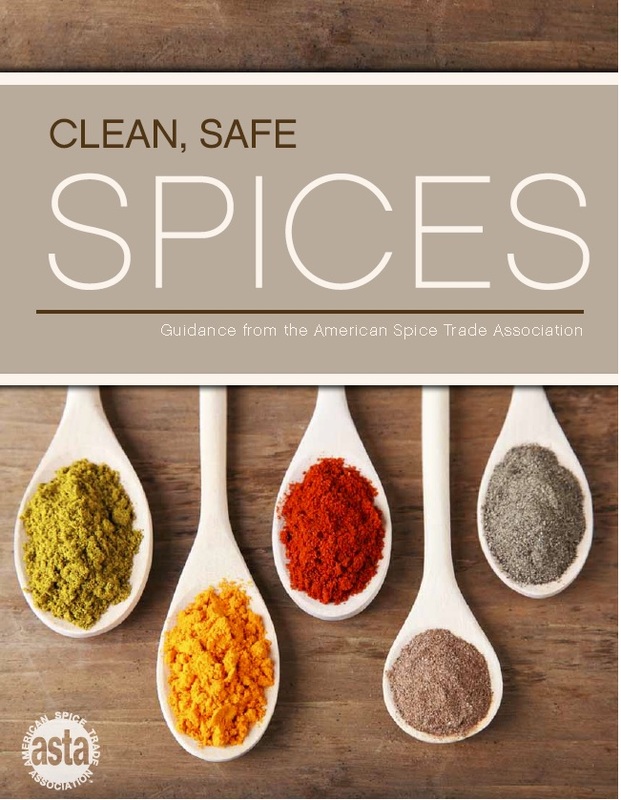 Clean, Safe, Spices Guidance Document ASTA produced this guidance document to assist the spice industry in developing programs that minimize the risk for contamination of spices and to help industry firms provide clean safe spices to their industrial, food service and consumer customers. ASTA continues efforts to provide information and resources to its members to address the many issues that have been raised as the result of the peanut protein that has been found in ground cumin. Also in this section are FAQs, FDA Guidance on Allergen Labeling, an FDA Intentional Adulteration Fact Sheet and draft guidance from Food Chemicals Codex on economic adulteration. Adulteration is one of the major concerns of the spice industry and this guidance document provides a tool for companies to identify circumstances when adulteration may occur and then take steps to prevent it. The ASTA guidance is based on a publication developed by the British Retail Consortium, the Food and Drink Federation and the Seasoning and Spice Association. HACCP Guide for Spices and Seasonings HACCP is the acronym for Hazard Analysis Critical Control Point and is used as an analytical tool to introduce and maintain a cost-effective, ongoing food safety program. The ASTA HACCP Guide for Spices and Seasonings which was updated April 2015 to include new tools was designed to address issues specific to the spice industry. White Papers White papers have been developed as needed on issues of significance to the spice industry. Cleanliness Specifications ASTA’s Cleanliness Specifications were developed to ensure that the spices meet federal regulatory requirements for safety and cleanliness. They were designed to meet or exceed the U.S. Food and Drug Administration’s Defect Action Levels. The Microscopic Identification of Spice Manual is a reference text for the microscopic or histological identification of pure spices. This is a CD-ROM that is available for purchase only. Available to members only, the Government Relations Committee has developed a series of issue papers on microbiology issues faced by the Association and its member companies. Information in the 14 monographs covers definitions, classifications, nutritional information, quality criteria, flavor chemistry and current and historical uses of a variety of spices. The ASTA Check Sample Program is designed to evaluate spice laboratories for a common range of analyses and spices that are significant to the spice trade. The program allows individual laboratories to evaluate their performance and set goals for improvement and consistency in analyses. IOSTA has developed a Good Agricultural Practices Guide to be used as a resource in the growing and harvesting of spices. This guide focuses specifically on the spice manufacturing environment, and combines recommendations and best practices from ASTA member companies. This ASTA guide provides an overview of equipment that can be used for the physical cleaning of spices.